While multiple reports suggest Apple has decided to place a greater focus on improving the performance and security of iOS and macOS, which will delay some new features until next year, it appears the company still aims to introduce the ability for Macs to run iPhone and iPad apps later this year. Mark Gurman and Ina Fried, reporting for Bloomberg News and Axios respectively, both claim the framework for combined apps remains on Apple's software roadmap for 2018, despite some planned iOS 12 features likely being pushed back to 2019, including a new home screen with a redesigned grid of app icons. Apple's software engineering chief Craig Federighi reportedly revealed the plans during a meeting with employees earlier this month. The report didn't explain how all of this will work, but Apple could be planning to release a new SDK with new APIs that enable true cross-platform functionality. Right now, Apple's UIKit and AppKit frameworks provide the required infrastructure for iOS and macOS app user interfaces respectively. It's worth noting that Apple already has a private framework called UXKit, used for the Photos app on Mac. In 2015, Jason Snell said UXKit "sits above the Mac's familiar AppKit frameworks and strongly resembles UIKit on iOS." Apple tentatively plans to begin rolling out the change in iOS 12 and macOS 10.14, so there will likely be an announcement at WWDC 2018 around June. 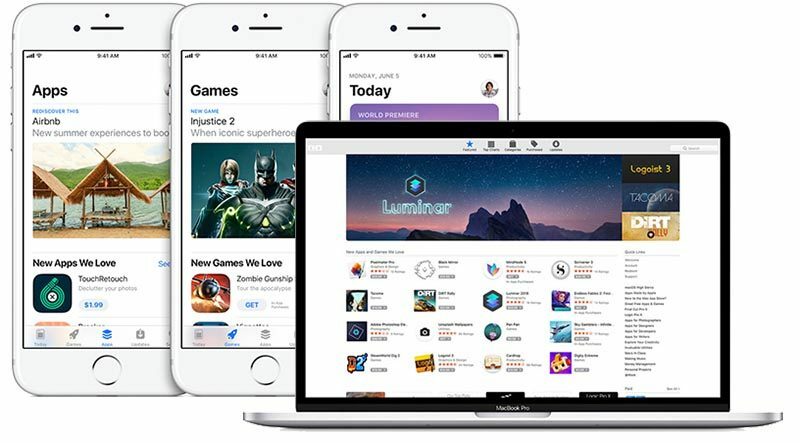 Following a few months of beta testing, major new versions of iOS and macOS are typically publicly released in September and October respectively. The project is reportedly codenamed "Marzipan" within Apple. Gurman speculated that universal apps would make it easier for Apple to one day create a single operating system for all of its devices, should it ever go down that avenue. At the very least, it could bring some renewed attention to Mac apps. Not if it means dumbing down macOS to the level of iOS. So, are they going to eventually bring a cursor and bluetooth mouse support to iOS? And the dumbing down of the mac continues. Well there you go. Looks like Apple is doing something I was not expecting. One 'app' works across all platforms. No emulation required. The Mac OS app portion will be built to run on Mac OS. iOS 'app' will be built to run on iOS. The 'app' container just contains the Mac OS, and iOS app package. The UI will be built as appropriate for the different platforms. You won't be getting an iOS interface when running on Mac OS or vice versa. Nothing magic about this, its just about App distribution. One app container that will run against all platforms. How is unifying the developer framework of their apps dumbing down the Mac? The developer community for great Mac apps is constantly dwindling as more and more devs are shifting attention to mobile. Giving devs a framework to run apps cross platform will only push greater and more unified functionality regardless of whether you're running your phone, tablet or computer and open up a slew of new options for Mac users. This also moves Apple towards a potential reality where they can dump Intel as A-series chips become more and more powerful. Then will a touchscreen make sense on a laptop Apple??? I feel like this is a rumor misinterpreted from another rumor. It was reported before that Apple would sell universal apps that worked cross platform. But this was in regard to licensing. Meaning, I buy fantastical on iOS and the Mac version is licensed to me as well with the same purchase. I don’t see Apple doing what this new rumor suggests. Fix the Photos/iTunes sync issue with large photo libraries and a lot of people will be happy. In short, this is a good move to concentrate on stability and performance. As far as the rest, don't spread the engineers too thin.